The switch from 32-bit versions of Windows to 64-bit versions has been a slow transition. Although Windows XP, Vista, and 7 all have 64-bit versions available, many companies still opt for the 32-bit versions. The biggest reason for this is compatibility issues with older programs, hardware, and drivers. Microsoft recognizes that wanting to use older programs is a barrier for people who may be considering moving to a 64-bit version of Windows. In anticipation of this barrier, the software giant built into Windows 7 and later the ability to select a variety of compatibility options to ensure that older programs have a good chance of working under the new 64-bit operating system. Before you begin using compatibility options in Windows 7 & 10, you should know a few things. First, there is no guarantee that selecting compatibility options will make all of your old software work. These options are simply an attempt to simulate the operating environment of older versions of Windows. Second, you can make compatibility changes to either programs themselves or shortcuts to programs. Either way, you will need to undo these changes if you want to revert back to normal operating mode. If you make compatibility changes to a program shortcut and then delete that shortcut, you will have to locate either another shortcut to the program or the program’s exe file to undo or make further compatibility changes. If this sounds complicated, don’t worry it’s not. Choosing compatibility options for a program is as simple as selecting and deselecting options from a list. Let’s say you have an old program installed on a 64-bit Windows PC and you are having trouble running it. The problem may be a compatibility issue. Although Microsoft has done a good job of maintaining compatibility when a user runs a 32-bit application on a 64-bit platform, not every contingency can be anticipated or resolved. 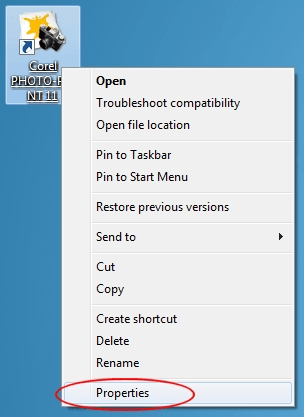 To begin using compatibility mode options in 64-bit Windows 7 or 10, right click on the program or shortcut to the program that is not running properly and choose Properties from the menu. You should now be looking at the properties for the program. Click on the Compatibility tab and notice that you have a number of options available. Each of the options falls into one of three categories: Compatibility Mode, Settings, or Privilege Level. Below is a description of each of these options. This option is a great choice when you know exactly which version of Windows your program runs well under. For example, if your program was released at the time when Windows XP was the reigning version of Windows, clicking the option box titled Run This Program in Compatibility Mode and choosing Windows XP from the drop down list is good choice. 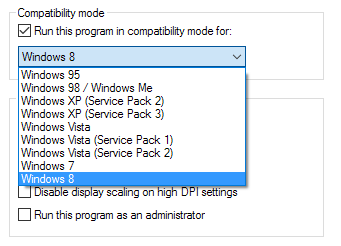 Notice that compatibility mode offers many choices ranging from Windows 95 up to Windows 8. Also notice that you can even choose to run your program in compatibility mode for different service packs of the same operating system. 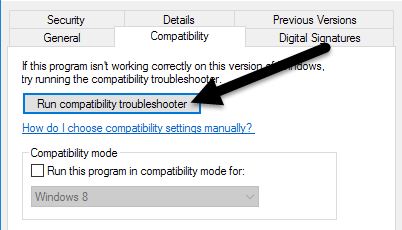 Note that in Windows 10, there is a new option called Compatibility Troubleshooter, which will scan the program for you and try to figure out the best settings automatically. When you run it, you can try the recommended settings, which will attempt to choose the correct settings automatically or you can choose Troubleshoot program, which will ask you questions about problems you are having and then recommend settings. 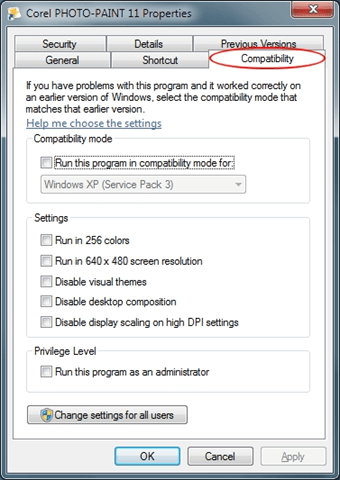 This section of compatibility options lets you fine tune your compatibility experience for your old program. Generally, these options are for programs that were written for and run on very old versions of Windows such as 95, 98, and ME. For example, the native resolution and color depth of Windows 95 was only 640×480 at 256 colors. If your old program is running but looks too small or has strange colors, try these two options. If Windows warns you that the program is incompatible because of some video issue, consider trying the compatibility settings labeled Disable Visual Themes and Disable Desktop Composition. These settings often interfere with outdated video rendering in old programs. Finally, if your program was written for a 4:3 ratio screen, consider trying the option titled Disable Display Scaling on High DPI Settings. This one will not scale the program to fit the current resolution and aspect ratio of your monitor. Note that some of these options are not available in Windows 10 and some have been moved around. For example, Windows 10 no longer has Privilege Level, but instead lists the option to run the program as an Administrator under Settings. The last option on this window has to do with how Windows currently assigns permissions in Windows 7/10 and how it used to assign permissions in previous versions of the operating system. Windows 95, 98, and ME did not take advantage of multiple user accounts; everyone used the same desktop, had the same permissions, and had complete control over every aspect of the operating system. Essentially, everyone was a top-level administrator. This is a problem for programs released under those conditions because they enjoyed nearly unbridled access to hardware, software, and drivers. Checking this option will ensure that the program has the permissions it needs to run as if it had this kind of control again. It seems everyone has some old program that they wish would work under Windows 7 or 10. If you are running the 64-bit of Windows, you are even less likely to get that program running than if you use the 32-bit version. However, by taking advantage of compatibility mode options you may be able to use your old software again and avoid having to consider other options such as dual booting your PC with an older version of Windows or running a virtual PC from within Windows.